Scarlet uses classical ballet and film to bring Nathaniel Hawthorne’s classic novel The Scarlet Letter to life. Ballet 5:8 Artistic Director Julianna Rubio Slager’s Scarlet gives audiences a fresh look and response to Nathaniel Hawthorne’s classic novel The Scarlet Letter. The groundbreaking, multidisciplinary production uses classical ballet, film and Spoken Word to bring the classic story to life. Following each performance, audience members are invited to attend a TalkBack panel discussion with the performers and choreographer. The full-length ballet follows the iconic Hester Prynne as she wrestles with her open guilt and grief in a judgmental society, even while Reverend Dimmesdale suffers in silence with his hidden sin and secret love. The classic story delves into the timeless struggles of hypocrisy, shame and ultimately, the hope of redemption. "The source material for Scarlet — familiar to so many Americans — makes this ballet accessible, and new audiences will clearly recognize that while some of us must wear a badge of shame, everyone's petticoats are scarlet." Building from a stunning score by American modernist composer Charles Ives, Scarlet blends choreography by Ballet 5:8 Artistic Director Julianna Rubio Slager with an original Spoken Word performance by Chicago artist Kylla Pate, and film elements directed by Preston Miller. The project weaves the visual strength of film and the emotional impact of Spoken Word into the beauty, grace and power of ballet. In order to recreate Hawthorne's characters in a way that mirrors the novel, Scarlet brings live ballet, film sequences, and Spoken Word together for the purpose of storytelling. Hawthorne’s novel The Scarlet Letter relies on many moments where the narrator unveils the soul of the characters through their inner dialogue. In much the same way, the live dancing carries the plot line of the narrative while the added elements weave the characters' internal struggle and emotion into the story in a cohesive, textured and innovative way. Each artistic discipline adds a unique texture and voice into the narrative, creating a multi-layered and dynamic experience within a timeless story. "A book from high school English inspired Julianna Rubio Slager to write a full-length ballet." "Based on The Scarlet Letter, the landmark 1850 novel by Nathaniel Hawthorne, Scarlet reexamines morality through the public and private struggles of flawed characters in a socially rigid community." "Choreographer and Artistic Director of Ballet 5:8, Julianna Slager, has spent years meticulously researching and fine-tuning her choreography in preparation for Scarlet to return to the stage..."
"Great art has the potential to inspire even greater, more contemporary art. 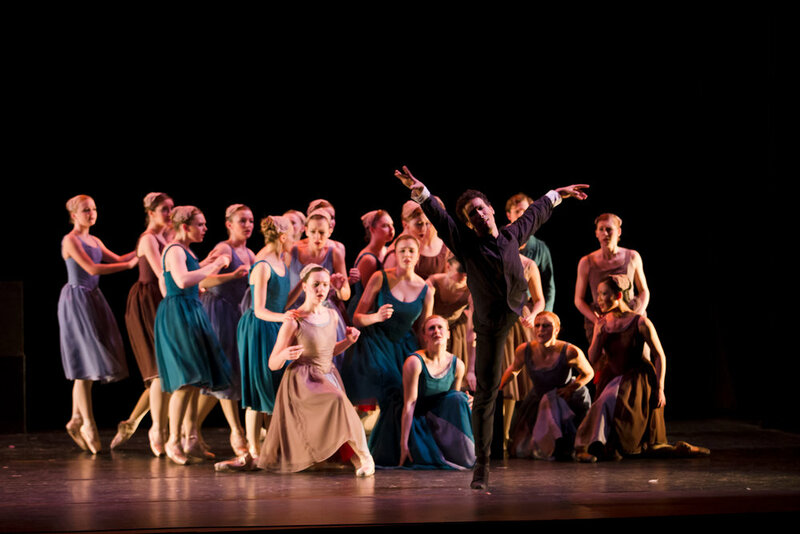 Scarlet, the latest ballet and film hybrid performance by Ballet 5:8 is a prime example." "Scarlet is inspired by Nathaniel Hawthorne’s classic novel The Scarlet Letter, a tale of the struggles of hypocrisy, shame and the hope for redemption." friends of Ballet 5:8 who believe in the importance of storytelling.